"One of the best inventions of the past 20 years - perfect for my Dachshunds"
"A fantastic dog bowl. The Road Refresher is genuinely unspillable no matter what you do." The Road Refresher Bowl can help pet parents breathe easier when Fido takes a car or boat trip with them. Velcro fasteners that go on the bottom of the 54-oz. bowl keep it in semi-permanent place. US President Barack Obama has ordered a Road Refresher Non-Spill Pet Bowl for his dog, Bo. Natalie and the Road Refresher non spill dog water bowl appear on Reuters news. Natalie and the Road Refresher non spill dog water bowl appear on BBC Look East. Dragons' Den reject defies the odds to make £1m in the U.S.
A Dragons' Den contestant who was told she would be 'walking into the lions' den' if she tried to sell her invention in the U.S. has turned over £1m in just four months. Natalie and the Road Refresher non spill dog water bowl appear on BBC Breakfast. UK Fire and Rescue Dog's thirst extinguished by the Road Refresher travel bowl! Being on call 365 days a year, in sometimes..
Search and Rescue team take on the Road Refresher pet travel bowl for deployment to disaster areas. The Road Refresher is now being tested by several police dog handlers around England. Here is another happy and refreshed working police dog. Natalie Ellis, Inventor of the Road Refresher bowl won three awards at the British Female Inventor of the Year Awards (BFIIN) in Cardiff, Wales, March 2008.. The Rescue team with their dogs, and Road Refresher bowls, during a training session..
Road Refresher has also appeared on News at 5 with Natasha Kaplinsky, KUTV Ohio USA. Road Refresher appeared on Send in the dogs on ITV as it was used by the Police Dog Handlers on the show. Your Dog Magazines "Tried and Tested"
Road refresher score 5 stars in Your Dog Magazines "Tried and Tested".. The renowned, Essex Dog Display Team, who travel thousands of miles each year to attend prestigious events throughout the British Isles, have taken a new approach to their dogs..
SPILLPROOF PET BOWL Keeping pets hydrated on the move without making a mess isn't.. 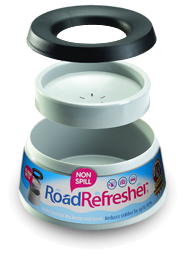 The Road Refresher non spill dog water bowl appears on O2 News.